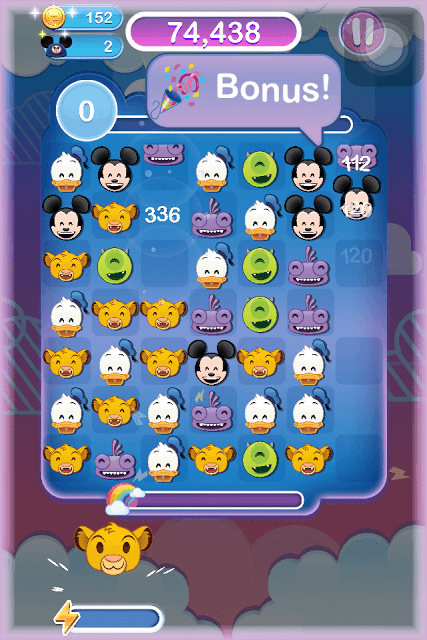 Disney Emoji Blitz is proof that fast-paced match-3 puzzle games can be a whole lot of fun. The game lets you match 3 or more emojis as fast as possible before the timer runs out. There are various missions to complete and finishing a set of challenges will unlock a treasure chest. But the fun does not stop here. 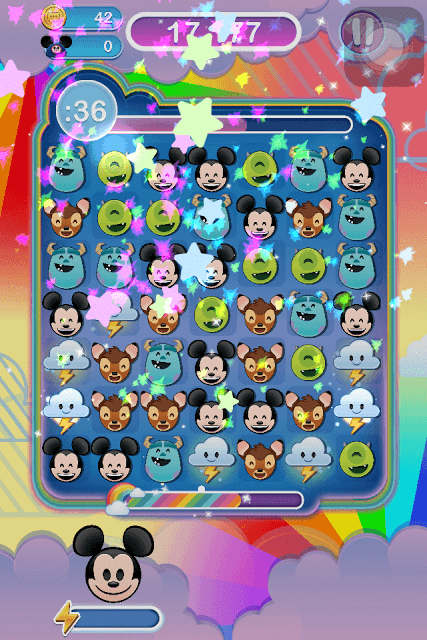 The game also lets you unlock and collect various Disney character emojis. 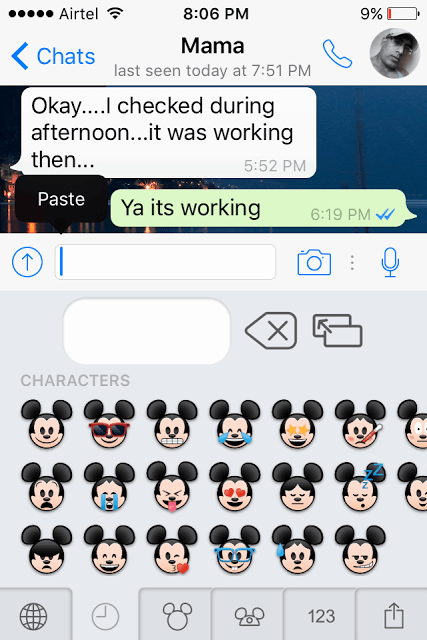 They can then be enabled on your keyboard and you can use them on messengers like WhatsApp. The starter emoji is not only cute, but also possesses special powers that can help you clear several emojis on the game board. There will be 3 characters and you will need to choose one of them. Each emoji offers a unique power-up. For example: Sulley roars and scares random emojis off the board. Ariel creates a bubble wave to clear away a set of emojis and with Simba, a group animals run left and right to clear a row of emojis. After choosing a starter emoji, it will be unlocked and added to your smartphone/tablet keyboard. The power-up of your starter or Hero emoji is activated when his/her power meter charges up. The power up meter is located at the bottom left corner of the screen. It charges a bit every time you match 3 or more Hero emojis. It won’t fill if other emojis are matched. Once it fully charges, tap it to activate power-up. First emojis won’t be available sooner or unlocked, so choose your starter emoji wisely. You can later switch to an unlocked emoji later by tapping the “More” button on the Missions screen. The Blitz meter at the bottom of the game board fills little by little every time you clear emojis. The more emojis you clear in one move, the faster the meter fills up. Look for 4 or more matches if you want to fill the meter real fast. When it is full, you will enter Blitz mode, which gives you a chance to earn extra points for a few seconds. What you have to do is match as many objects as fast as possible to earn bonus points until the bonus mode is active. You can activate the power-up meter at the bottom left corner of the screen when the Blitz mode is active. This way you will be able to clear more emojis quickly as the bonus mode stays on for a few seconds and you will have to remove as many emojis as possible. Save power up meter for Blitz modes to get max bonus points. Before start of play, the game lets you buy boosts such as Full Power and Sunshine. Use such boosts as soon as the blitz mode is activated so that more and more emojis get cleared from the game board. Try and use the extra time boost when the Blitz mode starts (I am not sure whether this will extend the time, but there’s no harm in trying). Try to look for bigger matches when the mode is active. Match 4 or more emojis to create power-ups and quickly swap with any emoji to clear more objects from the game board. Lightning Cloud: This power up can be created by matching 4 emojis of the same type. The lightning cloud can be used to clear a row or column of emojis and it totally depends on the direction you move it. If you swipe up/down, then a column will be cleared. If you move it left or right, an entire row will be cleared. If two lightning clouds are placed next to each other, just move one of them towards the other lightning cloud to remove 3 rows/columns of emojis. If one cloud placed below the other is moved down, 3 columns will be cleared. If a lightning cloud is placed next to the other emoji, 3 rows will be cleared. Rainbow Star: You will have to match 5 emojis to create a rainbow star. Now swap it with an emoji to clear all emojis of that type. A rainbow star can work wonders if you swap it with another rainbow star or any other power up. Swap a rainbow star with a lightning cloud and you will several lightning clouds scattered all around the game board. Swap it with Sunshine power-up to create several sunshine tiles. Sunshine: To create Sunshine, you will need to match 5 emojis in an L- or T-shape. Once created, swap it with any emoji to trigger a cross shaped blast, which will clear a column and row at the same time. Swap Sunshine with Lightning Cloud to trigger a star-shaped blast, which will not only clear a column and row of emojis, but also clear emojis in a diagonal line. On your iPhone, go to Settings. Go to “General” (gear icon), scroll down and tap “Keyboard”. Under “Third-Party Keyboards”, you will find “Emoji Blitz”. Go on tap it. It will be added to your keyboards list. Next, tap on Emoji Blitz and enable “Allow Full Access” by moving the slider right. A new window will open. Tap “Allow”. To test your emojis, go to WhatsApp, email app or any other messaging app and long press the Globe icon located beside “123” on the keyboard. Tap Emoji Blitz to select it. You will notice all your collected emojis as well as items will appear in a separate keyboard. The most awesome thing about the unlocked emoji character is that it will have different emotions. So if you unlocked a Mickey Mouse Emoji, then you will find a crying Mickey, laughing Mickey, teasing Mickey etc. Items look different from emojis on the game board. They can be souvenirs, fruits, drinks, Mickey’s special items and many more. Once you have unlocked the “Item collection” tab, you can start collecting them. They will appear randomly on the game board. There are various types of item collections, and each collection provides a unique reward once you have all items. Collecting all “Magic Morsels” items will grant you gems. Once you complete this set, a new collection titled “Mickey’s Stuff” will be unlocked. And completing this collection will get you Sunshine, lightning cloud or any other power up. There are several collections, which can be accessed by tapping the third tab beside leaderboard. To collect items, you will have to bring them down to the bottom of the game board and make them disappear. Once you collect a set of items, you will receive a special prize. The collected set will also be added to your emoji blitz keyboard. To bring an item down to the bottom faster, you should know how to use certain power-ups like the lightning cloud properly. If both the special item and the lightning cloud power-up are in the same column, swipe the lightning cloud up or down to clear the column. The item will be immediately brought down and disappear. Completing missions will help you get closer to the treasure chest. The chest unlocks when the “Missions” meter is full. The Missions meter fills a little every time you complete a mission. There are various types of missions and there’s no hurry to complete them. Just keep playing the game to complete them as and when you want. When the treasure chest unlocks, you will receive plenty of coins. Save the coins to open the Silver or Gold box, which may contain a brand new Disney character emoji. Every second counts, so you try to match as many emojis as possible. You can match two sets of 3 or more emojis at the same time. So once you finish swapping emojis to make a match, quickly spot another potential match and swap emojis to get another match at the same time. This way you will keep matching emojis and earn more points. You should have a keen eye in spotting potential matches. Apply the same strategy in Blitz mode as well. The game offers a free prize every 8 hours. Free chest provides gems, coins, but chances of getting an emoji are less. To get an emoji, spend 15000 coins to open the Silver Box. To get a rare emoji, spend 30000 coins to earn Gold Box.